India and China: An Evolving Theatre of Competition? The global order has become a matter of debate and discussion, given the alternatives that are emerging. It started with the proposal of an Asian Monetary Fund, expansion of the UN, and the incremental evolution of BRICS. In the present context, the evolving global order resonates with the struggle between the aspirations of the new rising powers, particularly China, and the dominance of the western powers. The gradual shift of economic weight from West to East is also contributing to this discourse. Further, the unipolar world is getting eroded, while a multipolar configuration is emerging. Within Asia, the US wants a unipolar configuration, while China proposes a multipolar order; thereby challenging this configuration. For India, multipolar dynamics would serve its interests better than a unipolar order. This multipolar dynamic has created a natural urge to build coalitions, as well as create a sustainable geopolitical equilibrium. In this transitionary phase, the trajectory of the new world order is not very clear, but zero-sum games based on power play are also not an option. This argument can be made on the very fact that Non-Traditional Security threats (NTS), which were not seen as an important factor in the 1980s, have become a strong independent variable affecting all nations and influencing interstate relations. Furthermore, the NTS have created a comfortable zone of cooperation. However, this easy denominator has ignored core security issues, leading to tensions mounting in the East China Sea and South China Sea. In the context of Southeast Asia, the struggle between the two powers, the US and China, in terms of defining the terms of engagement and subscription to new architectures supported by the two powers, has been a matter of conjecture. High level meetings between the heads of government in Beijing and Washington, while at the same time the clear display of brinkmanship in the South China Sea and US support to Japan on the East China Sea, gives a contradictory picture. In the case of the global economic scenario and the evolving situation in the Middle East/West Asia, the US needs China's support to resolve the issue, while in the case of East Asia and Southeast Asia, US credibility is at stake because of the increasing subscription of many countries in the region to China's charm offensive. How it will play out in future remains to be seen, but with India raising its stakes in Southeast Asia through initiatives such as land and maritime connectivity, as well as increasing defence and maritime cooperation with countries such as Singapore, Malaysia, Indonesia, Vietnam and the Philippines, it is clear that India has carefully calibrated its Act East Policy (AEP), the successor to the much celebrated India's Look East Policy. In the regional affairs, NTS such as water, energy, terrorism, piracy, transnational crime, pandemics, food security etc., have forced major powers to cooperate and work towards building consensus. This has facilitated multi-nation Humanitarian Assistance and Disaster Relief exercises, as well as Standard Operating procedures in case of any natural disaster or unforeseen accident. This compulsion to cooperate was reflected during the unfortunate incident of the missing MH-370 Malaysian airlines aircraft. This one incident exposed the limitations of all major powers, and provided food for thought for global search and rescue cooperation. The three major issues of food, water and human security will dominate the international discourse in the coming years. India has highlighted these issues in forums such as the UN, WTO and also worked towards galvanizing support among developing nations. However, in Southeast Asia competition or cooperation between India and China will be defined by three major objectives: regional security and national interest, economic advantages because of regional trading agreements, and the socio-cultural agenda. While India has always been averse to any alliance or collective security order such as NATO, it has carefully endorsed the development of order-based security through multilateral security structures. The balance that India has created between US mandated security and developing regional forums to address localized issues has been an area of importance. From India's point of view, its stance on regional issues, particularly security and economic aspects of its engagement, has been dictated by two different discourses. While defence and strategic analysts call Southeast Asia the zone of inert competition, there are also covert arrangements through defence cooperation agreements and exercises. India has been conducting exercises with Thailand, Indonesia, Vietnam and Singapore, and is keen on expanding its horizon to include Myanmar and the Philippines. The contours of such exercises are primarily aimed at counter insurgency and coastal exercises. For China, increasing exercises and India's exercises with South China Sea claimant countries is increasingly seen as an assertive posture, and India has weathered China's warning in the South China Sea in the past. In 2011, INS Airawat was warned near the territorial waters off the coast of Vietnam. India's submarines have regularly been deployed on operational missions across Southeast Asia, as well as the South China Sea. India has conducted exercises near the South China Sea with both Singapore and Vietnam in the past. China's assertive posture in the last couple of years has posed serious concerns to the military establishment, because more than 50 percent of India's East bound trade passes through the South China Sea. Freedom of navigation and the freedom to exploit resources near territorial waters off the coast of littoral states have been reiterated by India in the last three ASEAN Regional Forum (ARF) meetings, in addition to highlighting its concerns at the East Asia Summit. The resolve of India to counter China's assertive posture through multilateral forums have become more pronounced, because artificial island building and the declaration of an Air Defence Identification Zone (ADIZ) in 2013 have reduced maneuvering capability in the otherwise 'Free Seas'. Coordination between Japan, the US and India has been increasing. This can be seen in military assistance in terms of Lines of Credit and Fast Attack crafts provided by India and Japan, as well as US military aid to select countries in Southeast Asia, which is a clear manifestation of increasing convergence on strategic issues between the three countries. The resurrection of the trilateral exercises, better known as the Malabar exercise, in 2015 between the US, India and Japan clearly shows that India is keen that regional security should not be defined by China, but that it should enmesh itself into multilateral frameworks. This does not mean that India is outright demonizing China as the assertive power trying to destabilize Southeast Asia. India has used calibrated but firm moves in maintaining security and stability in Southeast Asia. This defence and strategic narrative has a valid argument, to prove that India and China might face competition among themselves. However, with the US and Japan playing the role of anchor, future competition will be defined not only between India and China but also between the four major powers. There is also an economic element of the competition, which defines more cooperation between the two countries. For India, bilateral free trade agreements such as the Comprehensive Economic Partnership Agreement (CEPA) and Comprehensive Economic Cooperation Agreement (CECA) with Thailand, Singapore and Malaysia, have opened new areas of trade with these economies. With Thailand, the number of items to be traded between the two countries has expanded, while in the case of Singapore and Malaysia, the CEPA and CECA respectively have an added element of trade and investment, as well as recognition of degrees and select sectors open for trade in services. However, with the coming into force of the India-ASEAN Trade in Services and Investment from July 2015, the avenues have opened. The Indian services sector is the most important and highest contributor to the Indian GDP. Therefore, this agreement is seen as expanding the horizons of engagement between the two sides. Of late, the percentage increase in bilateral trade has stagnated, and there is a need for more business facilitation and incremental reduction in tariffs. This might be achieved once India gains entry into RCEP. The Regional Comprehensive Economic Partnership, which involves ASEAN nations and the six dialogue partners, has seen tangible forward movement. For India, in the case of Japan and Korea, there has been a sizeable reduction in tariffs agreed, but with regard to China, the tariffs have remained pegged in the 40-45 percent bracket. RCEP, it is expected, will open new avenues for creating a regional economic trade bloc, but India is equally interested in becoming a member of Asia-Pacific Economic Cooperation (APEC). For India, the Trans-Pacific Partnership (TPP) is a very strict trans-regional trading arrangement, seen more as a WTO plus agreement. But it has not completely ignored this forum. However, two important issues such as Yarn Fibre Rule, rules of origin and issue of accession to the TPP are being closely studied by India's economic experts. Given the fact that China is not a member of TPP, India hopes to align with the TPP member countries such as Vietnam, Singapore and Malaysia to draw indirect benefits in the future. From a purely economic perspective, CLMV countries have been in India's Blueprint for its Act East Policy. This is because these four countries are perceived to have a relatively low economic base and therefore have the potential for low costs and better manufacturing capacity, which to a limited extent is highly dependent on political stability, sustained economic impetus, infrastructure and connectivity. The CLMV countries can be easily integrated into a regional value chain, which would also be integrated with India's Northeast Region. Secondly, for Indian industry to be competitive, cheap Chinese imports primarily in sectors such as steel, cement and automobile spares would give the edge that India has been seeking for quite some time. Furthermore, India's increasing competence in the services sector, which might get amplified because of the India-ASEAN Trade in Services and Investment Agreement, would open new vistas of sustained economic growth. In India, the services sector contributes to about 60 percent of the Gross Domestic Product. In the services sector, India might face competition from two economies namely Indonesia and Philippines. There is also a huge gap between India and China trade with Southeast Asia, with India-ASEAN trade hovering around US 78 billion dollars, while China-ASEAN trade is approximately US 480 billion. In terms of investment also, the relative figures are $ 35 billion and $ 130 billion. 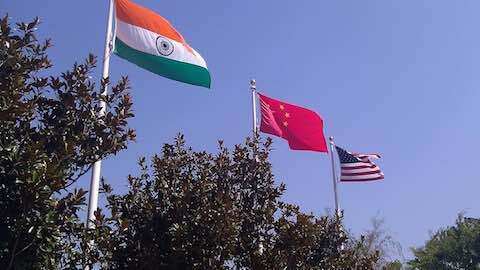 This element in the bilateral engagement is one where India fares much better than China. India has opened India centers, Rabindranath Tagore Centre and cultural centers to publicize ancient links, and has also helped restoration of temples' such as Angkor Wat through India's Archaeological Survey of India (ASI), which has given a new dynamism to India-ASEAN ties. The increasing number of flights, as well as India's easy visa process, has facilitated two-way movements of tourists. Indian tourists have been finding Southeast Asia as 'Near Abroad' and comfortable destinations; ASEAN travelers are yet to exploit the Indian hospitality. In the case of religion, India is likely to explore more areas of convergence in the near future. The agenda of the new government in Delhi under the Act East Policy is to build diasporic and religious linkages. The religious linkages particularly focus on exploring the Buddhist links and facilitating easy travel to pilgrims and religious leaders. Countries such as Myanmar, Thailand, and Cambodia practice Theravada Buddhism, one of the variants of Buddhism also practiced in India and Sri Lanka. The proposals for international Buddhist conclaves and conferences, as well as the publicity given to Nalanda University, have created a comfort zone for India. China might be concerned, as this umbilical cord has Indian advantage inscribed on it. The tug of war on issues such as diaspora, religion and culture might translate into latent competition between the two countries. There are three primary elements in India and Southeast Asia relations, which might define competition and cooperation between India and China. Given the fact that China's assertive posture has certain strategic elements embedded into it, India would like to cajole and even bring about multilateral consultations to bring China to comply with the regional security order. The support for a Code of Conduct on the South China Sea, and increasing defence interaction between India and select Southeast Asian countries, defines this. At the second level, the regional economic community which will come into being in 2016 in the form of Regional Comprehensive Economic Partnership will define whether India will be a gainer in its services sector or will provide advantages for Chinese goods because of its large market. Given the fact that manufacturing prospers only if it has economies of scale and low cost advantage, there will be a tug of war between the two countries. This quid pro quo might find its manifestation in the form of non-tariff barriers and restraining market access. The third element of competition will be the cultural and social domain. While many Southeast Asian countries have seen authoritarian regimes, two party systems and very nebulous democracies, the governance systems and the role of the Diasporas of the two countries in political set-up in countries in Southeast Asia will gain salience in the future. Social interactions and people-to-people contacts will further define the role that the two countries will adopt. For the next few years, inherent competition and occasional cooperation is foreseen. Dr. Pankaj K Jha is Director (Research) with Indian Council of World Affairs (ICWA). He has also worked as Deputy Director with National Security Council Secretariat, Prime Minister’s Office. He earned his PhD from the Centre of Southeast Asia and Southwest Pacific Studies (now known as Indo-Pacific Studies), School of International Studies, Jawaharlal Nehru University. His latest book is India and the Oceania: Exploring Vistas of Cooperation (Pentagon Press, 2016). "India and China: An Evolving Theatre of Competition?"